Fruit flies are the worst kind of dinner guests—showing up uninvited, hovering over your food, and helping themselves to your beer and wine. If they're bugging you, try this free fix from your kitchen! When you get back from the grocery store with bags full of juicy strawberries, peaches, and cherries, your kids won’t be the only ones who want the fresh pickings. The season’s most persistent pests—fruit flies—will soon descend on and devour the fruits of your labor. 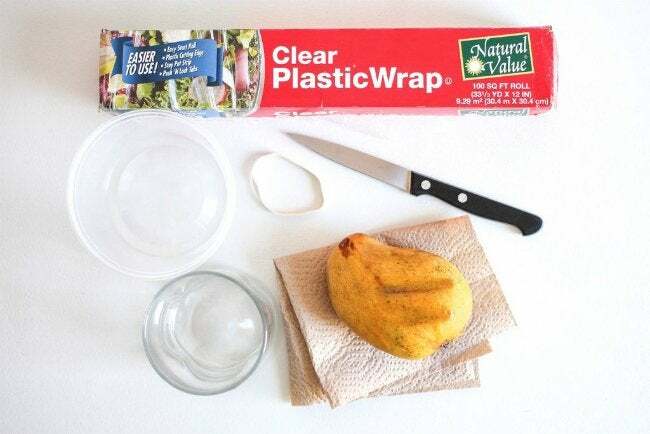 Before your kitchen turns into a bed-and-breakfast for bugs, take a cue from Instructables contributor NoFiller and build this budget-friendly fruit fly trap to catch flying foes and leave more fruit for you to enjoy. Short on patience with these uninvited guests and high on inspiration, this fruit fly whisperer devised an easy, homemade alternative to classic cone traps with a plastic yogurt container, plastic wrap, a rubber band, and bait. 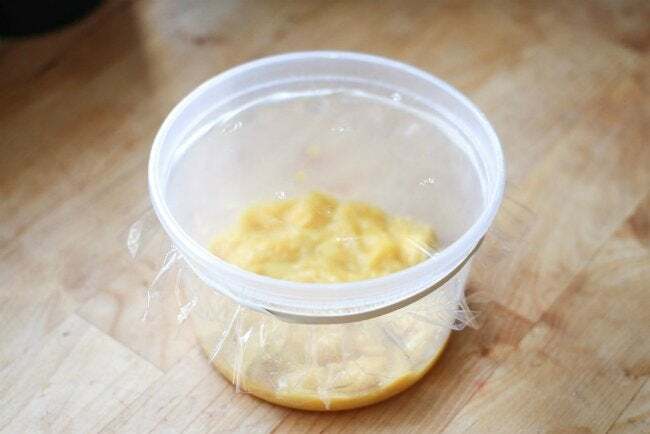 Because nothing is more irresistible to a fruit fly than its sticky sweet namesake, the DIY-er filled a clean container with sliced mango—though you can also use any fruit that you have on hand. No matter which you choose, adding an equally tempting liquid like apple cider vinegar or wine will lure the flies to death by drowning rather than simply entrapment. Once the cup was covered in plastic wrap and secured with a rubber band, NoFiller poked a few holes in the film with a knife—large enough for flies to crawl in, but small enough to keep them from finding their ways and flying out. With the trap done, there was nothing left to do but wait for the flies to take the bait. Once they beelined for the fruit, they became mired in the sticky mix. Economy and ease of construction aside, the best part about this simple snare is its portability (to, say, your deck or a picnic in the park) and disposability. When the homemade fruit fly trap is full, just throw it away—or build a few to make your home a no-fly zone!